It was not the finish the Parkland Rangers were expecting. The Rangers lost their final three games of the Manitoba AAA Midget Hockey League regular season and will miss the playoffs as a result. The week began with a 6-4 loss to the Brandon Wheat Kings, Wednesday in Dauphin. Carson Ransom and Brendan Kokorudz staked Brandon to an early 2-0 lead, but goals from Dustin Mozdzen, Bradley Marshall and Andrew Liwiski gave the Rangers a 3-2 lead after the opening frame. Calen Addison scored a pair of power-play goals to put Brandon back in front by the 8:35 mark of the middle frame. Liwiski and Tate Popple traded goals before the intermission and Brandon held a 5-4 advantage entering the third period, where Chipper Osiname sealed the win for Brandon with an empty-net goal. Josh Petersen made 35 saves to pick up the win, while Ryan Bezan made 24 saves in taking the loss. On Friday, Kyle Wiltshire’s goal with 3:15 left in regulation stoop up as the winner as the Winnipeg Thrashers beat the Rangers, 6-4 in Winnipeg. Cody Merritt and Nate Hooper gave the Thrashers a 2-0 lead heading into the first intermission and Wiltshire increased the lead to 3-0 just 15 seconds into the second. But the Rangers battled back to tie the game on goals from Marshall and two from Jaden Townsend. Carter Barley put Winnipeg back in front 1:52 into the third, but Morgan Laforce’s power-play goal at 15:06 tied the game once again. Wiltshire then scored his second of the game with 3:15 left and Dane Derewianchuk put the game away with an empty-net marker with 26 seconds left. Dylan Miskiw stopped 46 shots to earn the win for Winnipeg. Jonathon Faktor took the loss, stopping 30 shots. The season came to an end on Saturday with a 3-2 loss to the Pembina Valley Hawks in Morden. Townsend had the only goal of the first period and Marshall increased Parkland’s lead to 2-0 with the only goal of the second. Garrett Szeremley’s power-play goal at 6:30 put the Hawks on the board and Nicholas Hatley tied the game two minutes later. Wyatt Sabourin’s power-play goal at 11:11 lifted Pembina Valley to the victory. Aaron Brunn made 35 saves to earn the win, while Bezan made 18 stops in taking the loss. Rangers coach Doug Hedley said the most disappointing fact about missing the playoffs is the Rangers allowed other teams to determine their fate when they had their fate in their own hands. Even after the loss to Pembina Valley, the Rangers had a chance to crack the top eight if Brandon had beaten Kenora in regulation. That would have forced a one-game playoff between Parkland and Kenora, but it was not meant to be as the Thistles beat Brandon on Sunday, 6-2. “The fact is we just had to win one game. It was in our own control,” Hedley said. Although Hedley was hesitant to use it as an excuse, a short bench due to a number of injuries may finally have caught up to the Rangers, who had as few as 14 skaters for some games down the stretch. Tanyon Koshowski was called up from the Westman High School Hockey League’s Dauphin Clippers for the two games this past weekend and played well. He gave Parkland 15 skaters for the two games. Despite the short bench, Hedley pointed out the Rangers had a great second half of the season. “We’ve had these injuries for a long time. The way we had success was everybody was showing up. Against Brandon and the Thrashers, we chased the game for the first half because we were down 2-0 and we were down 3-0,” he said. Some players did have great efforts in the final two games, Hedley said, noting Marshall, Townsend and Braydee Prokopchuk were very good, the defence was consistent enough and the goaltending was solid. “There’s just some areas that we needed to bear down in,” he added. As much as it hurts for the players now, Hedley feels it will be a good learning experience for them. “The fact that we had the last month-and-a-half crucial to the way the kids played, they learned from experience playing through pressure situations. Hopefully, our guys learned again on Friday and Saturday, how important it is to be able to show up to play and contribute on a consistent basis. You don’t learn that unless you go through it,” he said. Hedley is proud of the way the players kept battling through all the injuries. Some teams would have folded their tents and quit on the season, but not the Rangers. 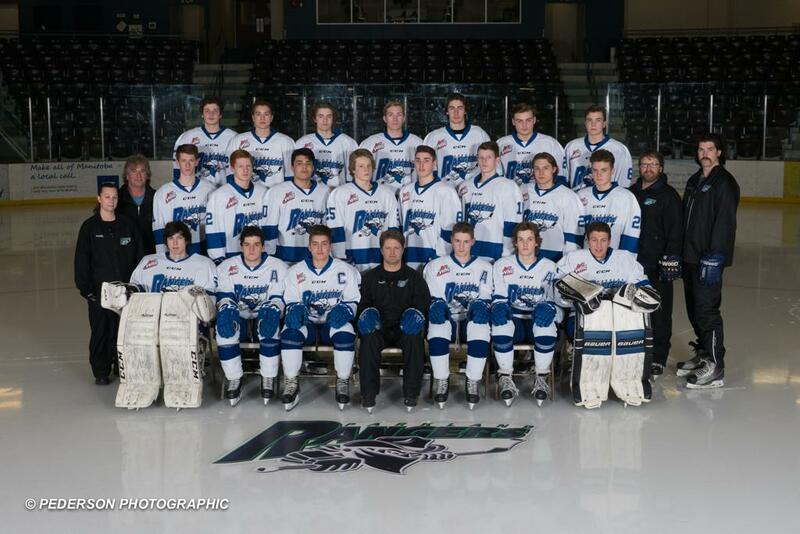 “We couldn’t have asked anymore of the kids that we had left on the ice and on the roster,” Hedley said. A two-game sweep over the Kenora Thistles this past weekend in Dauphin has the Parkland Rangers sitting in seventh place in the Manitoba AAA Midget Hockey League. Dustin Mozdzen had three goals and Bradyn Smelski had a goal and three assists to lead the Rangers to a 9-2 rout in game one Friday. Riese Gaber had a goal and two assists as that line combined for 10 points. Andrew Liwiski, Josh Wilkinson, Bradley Marshall and Kurtis Luke also scored for Parkland. Adam Withers and Brendan Martin replied for Kenora. Ryan Bezan made 24 saves to earn the win in goal. Brock Aiken allowed eight goals on 41 shots before giving way to Devon Caren, who stopped eight of the nine shots he faced. On Saturday, Mozdzen scored three times for the second straight game to lead the Rangers to a 5-3 victory. He was named Player of the Week for his efforts. 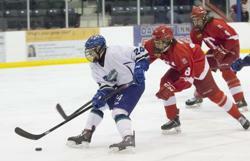 Gaber and Jaden Townsend had the other goals, while Hunter Buzzi with two and Trey Palermo scored for Kenora. For the second straight game, Bezan made 24 saves to earn the victory, while Aiken stopped 26 shots. Parkland improved its record to 19-18-0-4 for 42 points. They are now one point behind the sixth-place Brandon Wheat Kings and are two ahead of Kenora and the Southwest Cougars. Rangers coach Doug Hedley said the team put its speed to good use on Friday. And with only 14 skaters on Saturday, there was concern fatigue would catch up sooner or later. “But I thought tonight, we actually held them off in the second period. And, even though we were over half the period shorthanded, it really puts a strain on the guys that are overplaying. So we backed off and were on our heels a little bit and gave them some life. 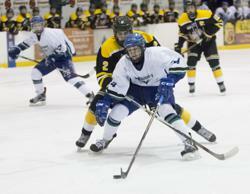 But then in the third period, we found a way to get it done,” he said. Parkland’s special teams had a good weekend. The power play scored four times on nine chances, while the penalty kill allowed just two goals in 14 opportunities. Hedley feels fatigue and frustration may have played a role in the number of penalties his team was assessed. “(Kenora) were physical with us and we knew they were going to be, because we don’t have a lot of skaters, number one, and we’re not a real big team right now. We’ve got about a thousand pounds out of our lineup when you take all those guys who are out. So we knew they were going to come hard at us,” he said. The regular season comes to an end this week, with the Rangers playing three games. On Wednesday, they play their final home game when they host Brandon at 7:30 p.m. On Friday they are in Winnipeg to face the Thrashers at 7:30 p.m. and on Saturday, they end the regular season in Morden against the Pembina Valley Hawks at 2:30 p.m.
Hedley expects Wednesday’s game to be a tough battle. “Brandon is going to be a team that’s battling for their life, too. So it should be a great battle. If we get the energy we got Friday night, we should be okay,” he said. It may be a while before the Rangers get any of their walking wounded back in the lineup. Kieran Raknerud’s cast will come off this week, Hedley said, and Chandler Musgrave will have to wait another week before his cast comes off. Chad Kilimnik is week-to-week, but has begun physiotherapy. Koby Morrisseau begins physio this week, but Hedley does not know when to expect him back in the lineup, if at all. Brendan Storey’s wrist injury was not as bad as originally thought. He will have an MRI on Wednesday. “Anybody back right now would definitely be a welcome addition, just to get some of that size back in our lineup that we’re missing so much,” Hedley said.